Remember the last time Democrat Candidate for Illinois Treasurer Mike Frerichs had an event with Chicago Mayor Rahm Emanuel? Well...we do. And we documented it. First, it started poorly when the Frerichs campaign insulted their host and failed to spell his name right. Imagine that....a guy decides to host a fundraiser at his house for you and you fail to even give him the proper respect by spelling his name right on the invitation. Notice that Mr. Florsheim isn't involved this time around for ole' Tax Hike Mike. We're not suprised. 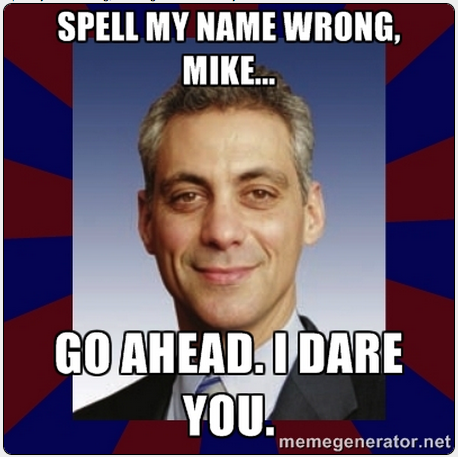 Then, the story got richer when Mayor Rahm Emanuel "challenged" Mike and his team via Meme on their spelling. Since the fundraiser tonight is at a restaurant, it has been MUCH, MUCH easier for the Truth Team to get one of our moles in there. Mike Frerichs might call them "Young Professionals", we just call them moles.